By a couple of weeks, this was actually the first Herald model to be launched, and was what Michelotti’s Herald prototype had looked like. Initially all Coupés were sold with a twin-carb version of the 948cc engine, though this was increased to a single-carb 1147cc along with the rest of the range in 1961. Front disc brakes became optional just before the engine swap. All but very early cars had strengthening ribs on the hardtop behind the side windows. 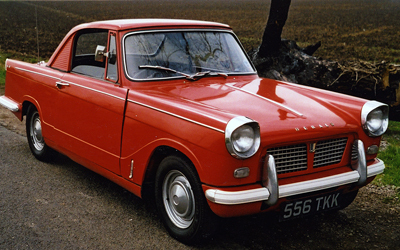 Though undoubtedly pretty and sought after today, the Coupé proved a poor seller and was discontinued in 1964.